OqxAB efflux pump has been found to mediate multidrug resistance (MDR) in various bacteria over the past decades. The updates on the nature and epidemiology of OqxAB efflux pump need to be fully reviewed to broaden our understanding of this MDR determinant. A literature search using the keyword of “oqxAB” was conducted in the online databases of Pubmed and ISI Web of Science with no restriction on the date of publication. The 87 publications were included into this review as references due to their close relevance to the nature and/or epidemiology of OqxAB efflux pump. The oqxAB gene generally locates on chromosome and/or plasmids flanked by IS26-like elements in clinical isolates of Enterobacteriaceae and Klebsiella pneumoniae, conferring low to intermediated resistance to quinoxalines, quinolones tigecycline, nitrofurantoin, several detergents and disinfectants (benzalkonium chloride, triclosan and SDS). It could co-spread with other antimicrobial resistance genes (blaCTX-M, rmtB and aac(6′)-Ib etc. ), virulence genes and heavy metal resistance genes (pco and sil operons). Both RarA (activator) and OqxR (repressor) play important roles on regulation of the expression of OqxAB. The dissemination of oqxAB gene may pose a great risk on food safety and public health. Further investigation and understanding of the natural functions, horizontal transfer, and regulation mechanism of the OqxAB efflux pump will aid in future strategies of antimicrobial usage. Antimicrobial resistance has posed increasing challenge to public health . Efflux pumps are found in almost all bacterial species and have important roles on both intrinsic and acquired resistance to antimicrobials by lowering intracellular antibiotic concentration and promoting site mutation accumulation [2, 3]. Most of the efflux pumps are located on the chromosome of bacteria . Plasmid-mediated efflux pumps have been described in recent years, such as QacBIII , Tet(L)  and MexCD  efflux pumps. In 2004, a novel plasmid-encoded multidrug efflux pump OqxAB was firstly identified on the pOLA52 plasmid in E. coli from swine manure in Denmark . The prevalence of oqxAB among Enterobacteriaceae have been increasingly reported over the past decades (Tables 1, 2 and 3) . The overexpression of OqxAB confers resistance to multiple drugs (quinoxalines, quinolones, tigecycline, nitrofurantoin and chloramphenicol), detergents and disinfectants (benzalkonium chloride, triclosan and SDS). This plasmid-borne multidrug efflux pump may pose a resistance problem, because it could facilitate the development of resistance to multiple drugs and dissemination of antimicrobial resistance via horizontal transfer. 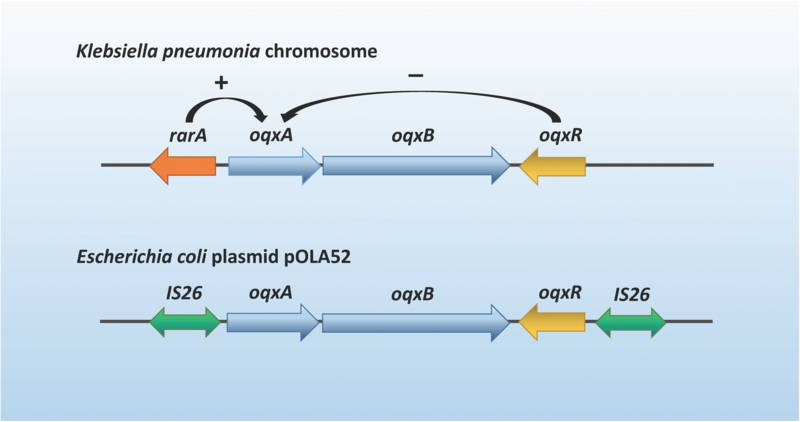 oqxAB operon was situated on pOLA52 plasmid in most strains. oqxAB was associated with IS26 and was carried on the 43- to 115-kb IncF transferable plasmid. Several oqxAB-positive isolates have high similarity and the oqxAB gene was primarily located on plasmids. IS26-flanked Tn6010 element was prone to excision via IS26-mediated recombination. oqxB20 and oqxB29 were identified. oqxAB was located on plasmid and successfully transferred to E. coli C600 by conjugation. First report of oqxAB-positive isolates from ducks and geese and as early as 1994 from chickens. 43.6% of the E. coli harbored at least one PMQR gene. The most common PMQR gene was oqxAB (29.3%), followed by qnr (13.6%), aac(6′)-Ib-cr (11.6%), and qepA (3.3%). Prevalence of oqxAB had significant Spearman correlation coefficients with MICs of quinolones. 68.2% of the cefotaxime and ciprofloxacin coresistant E. coli isolates carried at least one PMQR gene and eight subtypes of blaCTX-M were identified. Seven out of 17 strains were carried from three to six different plasmid types, such as IncF, IncHI1, IncI1, IncN, IncP, IncX1, IncY, and ColE. oqxAB, blaCTX-M and floR were co-transferred on F33:A-: B- and HI2 plasmids in E. coli. This is the first report of the presence of an oqxAB-containing plasmid in a human isolate of E. coli. Variants of oqxA2, oqxB2 and oqxB3 were identified in two E. coli strains. Epidemiology of oqxAB in Salmonella spp. First Detection of oqxAB on the chromosomes of two Salmonella Derby isolates from food. Combined effects of ESBL determinants and oqxAB were responsible for the emergence of XDR S. Typhimurium. Co-occurrence of qepA, oqxAB, and aac(6′)-Ib-cr with mutations in gyrA and parC and several ESBLs were noteworthy. GyrA mutations are the major quinolone resistance mechanisms in Salmonella. Overproduction of efflux pump and presence of qnr and oqxAB play additional roles. PMQRs greatly facilitate development of FQs resistance in Salmonella. Isolates which harboured more PMQR genes and accumulated more point mutations on GyrA and ParC presented higher resistance levels to quinolones. All the isolates carring transferable IncHI2-type plasmids haboured oqxAB cassette and incomplete class 1 integron. The blaCTX-M genes, 16S rRNA methylase genes (armA, rmtD or rmtC) and five plasmid-mediated quinolone resistance (PMQR) determinants (aac(6′)-Ib-cr, oqxAB, qnrB, qepA and qnrD) were identified in 18 S. Indiana and 17 S. California isolates. Variants of oqxA2, oqxB2 and oqxB3 were identified. The oqxAB gene was only found in K. pneumoniae isolates. Novel mutants (oqxA11, oqxB13, oqxB27, and oqxB28) were identified. The predominant coexisting ESBL and PMQR profile among our isolates included blaCTX-M and aac(6′)-Ib, oqxA, oqxB (28.3%) and blaTEM, blaSHV and aac(6′)-Ib, oqxA, and oqxB (19.4%) profile. Till now, several reviews have summarized the current knowledge of plasmid-mediated quinolone resistance (PMQR) genes, but there are no reviews specifically focused on the OqxAB efflux pump. A comprehensive understanding of the nature and epidemiology of this OqxAB efflux pump will benefit for future strategies of optimizing antimicrobial use and development of anti-resistance interventions. In this paper, a literature search was conducted using the online databases of Pubmed (www.ncbi.nlm.nih.gov/entrez/query.fcgi; 1809 until present) and ISI Web of Science (http://www.isiwebofknowledge.com; timespan 1945 until present) with no restriction on the date of publication. A total of 117 relevant publications were identified using the keyword “oqxAB”. Eighty-seven of the publications with close relevance to the nature and/or epidemiology of OqxAB efflux pump were included in this review as references. The updates on the genetic characteristics, prevalence of the OqxAB multidrug efflux pump in various bacterial species and its contribution on multidrug resistance were fully reviewed. The plasmid-borne OqxAB efflux pump has been reported since 2004. Sørensen et al. isolated an Escherichia coli (E. coli) from swine manure in a farm using olaquindox as a feed additive . Using agar dilution test with Sensititre plates, they found that this isolate was resistant or has reduced susceptibility to a number of antibiotics, including olaquindox (OLA; MIC 128 mg/L), carbadox (CBX; MIC 128 mg/L), ampicillin (AMP; MIC 32 mg/L), kanamycin (KAN; MIC 64 mg/L), chloramphenicol (CHL, MIC 64 mg/L), streptomycin (STR; MIC 128 mg/L), sulfamethoxazole (SXT; MIC 512 mg/L) and trimethoprim (TMP, MIC 32 mg/L). Through filter conjugation, the reduced susceptibility to ampicillin, chloramphenicol and olaquindox could be transferred to the recipient strain E. coli CSH26, while the resistance to kanamycin, streptomycin, sulfamethoxazole, trimethoprim and carbadox were not transferred. The transconjugants received a plasmid from the donor strain and this 52 kb plasmid was later named as pOLA52 . Subsequently, Hansen et al. subcloned and sequenced the genetic elements of this conjugative plasmid pOLA52 and found the genetic elecments was composed of three open reading frames encoding putative proteins (Fig. 1). Two of the proteins designated as OqxA and OqxB were highly homologous to efflux pumps from the RND family in other bacterial species. By homology modeling using the software of SYBYL X-2.0, we found that the positions and numbers of the transmembrane helices in the crystal structure of OqxB was highly consistent with AcrB protein in E. coli, MexB protein in Pseudomonas aeruginosa, CmeB protein in Campylobacter jejuni, AdeB protein in Acinetobacter baumannii and MtrD protein in Neisseria gonorrhoeae (Fig. 2). The ORF3 was homologous to a putative transcriptional regulator and may be involved in the regulation of oqxAB operon. The plasmid pLOW2::oqxAB in E. coli strain N43 was found to be a H-driven ethidium bromide efflux and showed high-level resistance to olaquindox (OLA; MIC> 128 mg/L) and chloramphenicol (CHL; MIC> 64 mg/L), while the control plasmid (pLOW2) in E.coli N43 only presented low-level resistance to olaquindox (OLA; MIC 8 mg/L) . This is the first report of a plasmid-encoded multidrug efflux pump conferring resistance to olaquindox . A gene cassette (mrkABCDF) was also identified on the pOLA52, which was in relation to the bacterial functions of type 3 fimbriae expression and biofilm formation . When the mrk operon was inactivated, the conjugative transfer ability of pOLA52 was also remarkably reduced. In 2008, the complete sequence of pOLA52 was analyzed and annotated . The 51,602 bp conjugative plasmid contained 68 putative genes, which were associated with functions of conjugation, replication and partitioning. Half of these genes constituted a conserved IncX1-type backbone. A fragmented Tn3 transposon encoded resistance to ampicillin. The RND family efflux pump encoding gene oqxAB and the biofilm formation involved gene mrkABCDF were located on two composite transposons (Tn6010 and Tn6011) . Tn6010-associated oqxAB was detected in Klebsiella spp. and Raoultella spp. by a reliable two-step PCR-based method . Chromosome-borne oqxAB was identified in Klebsiella spp. and Raoultella spp. by hybridization with I-CeuI-restricted genomes . A recent study of the evolution and dissemination routes of the oqxAB-like elements among different bacterial species found that the oqxAB gene was detected in the chromosome of all tested K. pneumoniae, even those isolated before the year of 1984, supporting that the plasmid-borne oqxAB was most likely to be acquired from the chromosome of K. pneumoniae and Raoultella spp. . The sequence of chromosome-based oqxAB in K. pneumoniae was highly homologous to the sequence of plasmid-based oqxAB in E. coli (e.g pOLA52) and Salmonella isolates, while low homologous to that in Enterobacter spp. Novel mutants named as oqxA2, oqxB2 and oqxB3 were identified in K. pneumoniae . A number of plasmid replicons were able to transfer the oqxAB gene, including IncF, IncH, IncI, IncHI2 and IncX [11, 15–18]. IS26-like insertion sequences flanked the oqxAB operon and the local repressor gene oqxR might be mobilized as part of a 6731 bp composite transposon known as Tn6010  (Fig. 1). The nimC element, blmS bleomycin resistance gene and transposition elements IS26 and Tn3 were located on the upstream of Tn6010 in Salmonella, indicating the possibility of transposition of an entire 10-kb fragment from pOLA52 . Many transcriptional regulators, like MarA, SoxS, RamA and Rob, have been reported to upregulate the expression of the RND type efflux pumps in Enterobacteriaceae, thus contributed to the MDR phenotype . In K. pneumoniae, the regulatory mechanisms of OqxAB efflux pump have been extensively studied. In 2012, a novel chromosomally encoded AraC-type positive regulator (RarA, regulator of antibiotic resistance A) was identified from K. pneumoniae. Overexpression of rarA can upregulate expression levels of its downstream efflux pump operon oqxAB and acrAB . The rarA gene was located on the genomes of several Enterobacteriaceae, such as K. pneumoniae, Enterobacter and Serratia proteamaculans. Plasmid-mediated overexpression of rarA can lead to MDR phenotype in either E. coli or K. pneumoniae without the presence of rob, marA or soxS, but requires the assistance of a functional AcrAB efflux pump. A transcriptome and phenotypic microarray study showed that rarA in K. pneumoniae may be associated with the functions of cell envelope biogenesis and posttranslational modification, transport proteins and the porin OmpF, and thus enhanced growth of the over expresser under the pressure of several antibiotic classes, i.e., minocycline, beta-lactams, polymyxin B, fluoroquinolones (FQs), furaltadone and sanguinarine . Jiménez-Castellanos et al. confirmed that the OqxAB was regulated by RamA and RarA, while AcrAB efflux pump was regulated by RamA and SoxS, and the outer membrane protein TolC was controlled by all these regulators in K. pneumoniae . RamA is the most effective transcriptional regulator of antibiotic susceptibility in K. pneumoniae, followed by RarA, SoxS, and MarA. Another GntR-type regulator, oqxR, was generally located neighboring to the oqxAB and could decrease the expression of the OqxAB efflux pump. Several amino acid substitutions including Phe6Ser, Gln11Leu, Asp95Glu, Val113Ile, and frameshift deletion of amino acids 73 to 77 or positions 88 to 94, have been identified on the OqxR and may be detrimental to its function . A novel amino acid substitution (Val102Gly) identified on the OqxR in a clinical isolate of K. pneumoniae could also induced the elevated expression of both oqxAB and rarA . Complementation with wild-type oqxR can restore the susceptibility to antibiotics and normalized the rarA and oqxAB expression levels. Overactivation of the OqxAB efflux pump contributed to the MDR phenotype and enhanced virulence of this particular clinical isolate . Taken together, oqxAB is subject to regulation by both RarA and RamA (AraC-type transcriptional activator) and OqxR (GntR-type transcriptional repressor). The overexpression of oqxAB was found to confer more than 4-fold reduced susceptibility to a variety of antibiotics, including quinoxaline compounds (olaquindox and carbadox), chloramphenicol, quinolones and fluoroquinolones, and trimethoprim. Besides, the OqxAB multidrug efflux pump also contributed to the reduced susceptibility to detergents and disinfectants, including benzalkonium chloride, triclosan, especially SDS . The oqxAB bearing plasmid pOLA52 could readily be transferred among Enterobacteriaceae and the transconjugants showed reduced susceptibility to chloramphenicol, ciprofloxacin and olaquindox . The MDR phenotypes were attributed to the overexpression of the oqxAB, as illustrated by the gene expression analysis. Transposition of oqxAB gene from chromosome to plasmids was able to result in more than 80-fold increase of the OqxAB efflux pump expression level, thus leading to the MDR phenotypes . Over the past decades, there have been increasing studies reporting the magnitudes of the OqxAB efflux pump’s contribution to reduced susceptibility to different classes of drugs, and the prevalence of oqxAB gene complex in various bacteria originated from human and animal sources (Tables 1, 2 and 3). OqxAB efflux pump has been the only known resistance genetic mechanism against quinoxalines till now. The quinoxaline representative drug olaquindox is generally used as a growth promoter on piglets at concentration up to 100 mg/kg per feed . In European countries, the application of olaquindox was banned in 1999 due to its potential toxicity . Furthermore, there have been serious concerns due to the possibility for selection of drug resistance since its introduction in the 1980s. An epidemiological study from Denmark in 1999 has demonstrated the presence of olaquindox resistant bacteria . Other studies also reported that the increase of olaquindox resistance increased along with the usage of olaquindox as growth promoter in the pig farms [28, 29]. The oqxA gene was detected in olaquindox resistant E. coli collected from Danmark and Sweden from 1995 to 1998 . In an epidemiological study from China, of all the 172 strains of E. coli, the oqxAB gene was detected in 46.3% of the isolates from swine, 13% from chicken, 43.9% from farm environment and 30.3% from farmworkers . In comparision to the oqxAB-negative isolates, the MIC50 values of quinoxalines (mequindox and olaquindox) were 8- to 32-fold higher in the oqxAB-positive isolates . In a recent study, the oqxAB prevalence among animals isolates (33.39%) was much higher than food (17.34%) and human (18.07%) isolates . Another study from Henan province in China showed that oqxAB were observed in 58.5% (62/106) of the E. coli isolates from dogs, 56.25% (36/64) from cats, and 42.0% (42/100) from human patients . The MIC50 values of olaquindox against oqxAB-positive isolates were 4- to 16-fold higher than those of the oqxAB-negative isolates . These studies demonstrated that the OqxAB multidrug efflux pump significantly contributed to the reduced susceptibility or resistance to olaquindox. The oqxAB was also reported to be responsible for the reduced susceptibility to another quinoxaline drug mequindox in E. coli. Of all the 1123 strains of enteropathogenic Escherichia coli (EPEC) isolated from farm animals in China from 1970s to 2013, oqxAB gene cassete was detected in 94.4% (322/341) of the high-level resistant strains (MICMEQ ≥ 64 mg/L) and 1.2% (9/782) of the low-level resistant isolates with mequindox MICs≤32 mg/L . In addition, the circular intermediate of IS26-oqxAB was deteced in 93.4% of the oqxAB-positive strains, suggesting that the oqxAB-carring transposon Tn6010 was unstable and tend to excision through the IS26-mediated recombination . Most of the studies regarding oqxAB have focused on the contribution of OqxAB efflux pump to the quinolone resistance, since quinolone and FQs antibiotics are one of the most critically important classes of broad spectrum anti-infective agents which are used to treat various bacterial infections in both humans and animals . The mechanisms of quinolone resistance mainly consists of target-site gene mutations that lead to amino acid substitutions in the quinolone resistance-determining regions (QRDRs) of the topoisomerase unit, reduced intracellular drug accumulation by overexpression of multidrug efflux pumps or decreased permeability of outer membrane porins, and plasmid-mediated quinolone resistance mechanisms . The oqxAB has been recognized as one of the four genetic mechanisms of the PMQRs in recent years and there is a lot of data with regard to its contribution to the FQ resistance phenotype (Tables 1, 2 and 3). As demonstrated by RT-PCR, the expression levels of oqxAB in ESBL-producing K. pneumoniae with reduced susceptibility to quinolones were 4-fold higher than the susceptible strains . Knocking out the oqxAB-encoding plasmid using homologous recombination in a FQ-resistant clinical E. coli strain with no mutations on the QRDRs of DNA gyrase and topoisomerase IV could decrease FQ MICs by 2- or 4-fold, and the OqxAB efflux pump may also work in conjuction with TolC to mediating the decreased FQ resistance . Wong et al. cloned oqxAB gene into a plasmid (pTrc) and transformed into Salmonella typhimurium strain LT2, and found that acquisition of the oqxAB-encoding plasmid by other two S. typhimurium isolates (strain 11–28 and strain 10–63) caused a 4-fold increase of MIC to ciprofloxacin and also conferred resistance to streptomycin, ampicillin, tetracycline, chloramphenicol, trimethoprim, sulfamethoxazole, nalidixic acid and olaquindox . The OqxAB efflux pump could not only mediate low-level quinolone resistance, but also is important for the bacteria to survive under low concentration of FQs and facilitate the subsequent topoisomerase mutations associated with higher level resistance . In comparison to the Qnr-producing isolates, the frequencies of topoisomerase mutations in oqxAB- and qepA-carring strains were relatively higher . A recent study showed that acquisition of oqxAB-carring plasmids by E. coli led to a 4–8 fold increase in the MIC and a 8–16 fold elevation of the mutation prevention concentration (MPC) to ciprofloxacin. Meanwhile, the development of FQ resistance was faster in the transformants bearing the oqxAB-carring plasmids than that in the parental strain, particularly before 16 passages . The oqxAB-carring plasmid in E.coli induced a fitness cost in vitro, however, the biological benefits were observed in vivo and their fitness was increased when combined with chromosomal mutations . However, the growth of oqxAB-bearing Salmonella was much weaker than the parent strain, indicating the fitness cost of acquisition of oqxAB in Salmonella . The oqxAB gene has been frequently detected in quinolone resistant bacteria, such as E. coli (Table 1), Salmonella (Table 2) and K. pneumoniae (Table 3). The prevalence of oqxAB in E. coli of human origin was firstly reported in 2009 and relatively lower than that of the animal or environmental sources . The oqxAB genes were 1 (0.4%) of 261 strains of E. coli, 3 (4.6%) of 65 strains of Enterobacter cloacae, and 100 (74.1%) of 135 strains of K. pneumoniae recovered from blood samples collected from patients in Seoul National University Hospital from 1998 to 2006 . Two novel mutants of oqxB (oqxB20 and oqxB29) were also identified E.coli in China . The first detection of oqxAB-carring E. coli in Latin America was in 2017 from Bolivia . The oqxAB (n = 15) and aac(6′)-Ib-cr (n = 14) were the most prevalent PMQR genes in 248 strains of levofloxacin resistant E. coli collected from a university hospital in Taiwan from 2001 to 2015 . Of 190 strains of E. coli collected from a rural and a urban hospital wastewaters in India, two isolates were found to be oqxAB-positive, emphasizing the importance to dispose the wastewater properly to reduce the pollution of environment with resistance genes and resistant bacteria . In comparison to the low prevalence of oqxAB in E. coli of human origin, the frequency of oqxAB in animal isolates is relatively high. The oqxAB was even detected in E. coli isolated from ducks, geese and as early as 1994 from chickens . The presence of oqxAB in E. coli from farm and wild lagomorphs was reported in Italy in the 113 strains of multi-drug resistant E. coli collected from 2006 to 2008 . The dissemination of oqxAB located on a transferable plasmid pHXY0908 between Salmonella and E. coli in the chickens gut was observed under the treatment of chickens with enrofloxcin . Several investigation data showed that in China the prevalence of oqxAB was in 19–51% in swine and chicken, which was higher than the prevalence of other PMQR genes (qnr 5.7–13.6%, aac(6′)-Ib-cr 4.9–11.6% and qepA 2.6–3.64%) in animal original strains, and much higher the prevalence of oqxAB in human strains [45, 48–50]. Many reports emphasized the co-spread of oqxAB with other resistance genes, virulence genes and heavy metal resistance genes in E.coli. The sequences of several plasmids from foodborne E. coli, such as pEC012 , pE80  and p42–2  had been published in the Genebank. These conjugative plasmids harbored multiple resistance determinants, including oqxAB, blaCTX-M-65, rmtB, fosA3 and floR, indicating a therapeutic challenge due to co-selection by various antibiotics and thus compromise the effectiveness of current antimicrobial strategies. In 2011, Liu et al. described co-existence of PMQR genes (oqxAB and aac(6′)-Ib-cr), ESBLs encoding gene (blaCTX-M-24) and a virulence determinant iroN on the same plasmid in an E. coli strain a6 . They further reported the co-dissemination of oqxAB, blaCTX-M and floR on the similar plasmids (F33:A-: B- and HI2)  and oqxAB, blaDHA-1, and 16S rRNA methylase gene rmtB on the same plasmid JGDA2 . In E. coli isolated from pigeon farms in China in 2011–2012, the PMQRs (oqxAB and aac(6′)-Ib-cr), CTX-M type ESBLs encoding genes (CTX-M-65, CTX-M-27 and CTX-M-55) and rmtB were found to be co-transferred by IncF plasmid alone or in combination with the IncK . The co-existence of oqxAB, blaCTX-M and other antibiotic resistance genes with the pco and sil operons, which contributed to the increase of the MICs to CuSO4 and AgNO3 on IncHI2 plasmids, were also observed . The co-existence of antibiotic resistance genes and heavy metal resistance genes might promote the development of multidrug resistant bacteria when exposed to heavy metals, particularly copper and zinc, which were commonly used as growth promoters for some livestock species. The first report of oqxAB presence in Salmonella was in 2012 and the oqxAB gene associated with IS26 was located on the chromosome of two strains of Salmonella Derby isolated from pork samples in Hong Kong . The oqxAB gene was detected in 112 (72.73%) of 154 strains of S. enterica serovar Indiana recovered from animals (n = 133) and humans (n = 21) in China from 2009 to 2013 and showed concurrent resistance to both ciprofloxacin and cefotaxime . The 12 (2%) of 546 strains of human clinical Salmonella Typhimurium collected from patients in China from 2005 to 2011 were co-resistant to both ciprofloxacin and ceftriaxone, four of the 12 resistant isolates carried oqxAB gene and a single gyrA (D87N) mutation . The oqxAB (42.0%) was found in 462 strains of FQ-resistant Salmonella collected from retail chicken meat in China during 2010–2011 . The prevalence of oqxAB was 16.1% in the 76 strains of cephalosporins resistant and quinolones resistant Salmonella identified from 1416 clinical isolates in Taiwan from 1999 to 2008 . Among 82 Salmonella collected from food in Shenzhen of China from October 2012 to June 2013, which showed co-resistance to three critically important antibiotics (ceftriaxone, 10%; ciprofloxacin, 39%; azithromycin, 25%), the oqxAB (91%), aac(6′)-Ib-cr (75%) and qnrS (66%) were frequently detected . The combination of oqxAB and a single target mutation on GyrA could possibly mediate development of resistance to ciprofloxacin in Salmonella, and dramatically reduced the time required for the development of a resistance associated with generation of double GyrA mutations and single ParC mutation . In Salmoenlla, the oqxAB was also found to be co-spread with other resistance genes. In 2013, Li et al. reported that the aac(6′)-Ib-cr (36.5%), oqxAB (31.7%) and qnrS1 (1.6%) were present alone or in combination in 63 strains of S. Typhimurium isolates collected from animals in China and the oqxAB and aac(6′)-Ib-cr genes were found to be located on the same IncHI2-type plasmids . Of 170 strains of Salmonella isolates recovered from 1540 chicken samples in China from 2015 to 2016, the resistance rates of ciprofloxacin, amikacin and cefotaxime were as high as 68.2, 48.2 and 44.7%, respectively and oqxAB (8.24%) and aac(6′)-Ib-cr (15.88%) were the most prevalent PMQR genes . Recently, the co-spread of oqxAB and mcr-1, which conferred resistance to colistin, were also found on a transferable IncI2 plasmid in S. Typhimurium /ST34 . The wide distribution of oqxAB was found among the clinical isolates of MDR K. pneumoniae, which is a frequent nosocomial pathogen and causes life-threatening disease in humans . In an international report of ESBL-producing K. pneumoniae, the oqxAB gene was detected in 87.5% (14/16) of the isolates collected from Hospitals in Taiwan, Australia, Argentina, Belgium, Turkey, South Africa, and the United States from 1996 to 1997 . For K. pneumoniae isolates collected from the mid-Atlantic, oqxAB was observed in 71% (22/31) of the ST 258 isolates and 91.7% (11/12) of the non-ST 258 isolates, respectively. The oqxAB was 100% detected among both quinolone resistant and quinolone-susceptible KPC-producing K. pneumoniae recovered from northeast Ohio . An epidemiology study from China reported that 66.9% of the K. pneumoniae were resistant to ciprofloxacin and the oqxAB gene was detected in all the K. pneumoniae isolates . Of 22 nonduplicate strains of ciprofloxacin-nonsusceptible K. pneumoniae (n = 22) recovered from blood samples of patients at a tertiary hospital in Korea from 2005 to 2010, oqxAB was detected in 11 (50%) strains of K. pneumoniae . Of 74 carbapenemase-producing K. pneumoniae collected from a tertiary hospital in China from 2012 to 2014, oqxAB was detected in 48 FQ-resistant and 2 FQ-susceptible K. pneumoniae isolates and Variants of oqxA11, oqxB13, oqxB27 and oqxB28 were identified . In the 247 strains of ESBLs-producing K. pneumoniae from 750 patients with nosocomial urinary tract infection (UTI), oqxA and oqxB were 56.7 and 54.6% of these isolates . Among the 40 strains of ciprofloxacin resistant E. coli and 50 strains of ciprofloxacin resistant ESBLs-producing Klebsiella spp. isolated from blood samples in Hungary, the oqxA and oqxB were 48 and 40% of the isolates, respectively . Among the 32 strains of K. pneumoniae from Tunisian hospital, oqxAB was observed in 65% of the K. pneumoniae . OqxAB was detected on the chromosome of a hypermucoviscous, multidrug resistant, biofilm producing K. pneumoniae strain U25 from India, as demonstrated by whole genome sequencing . OqxAB was also detected on the plasmid of IncR with other resistance genes like blaNDM-1 in two carbapenem resistant K. pneumoniae isolates collected from urine samples in a patient hospitalized at Annaba University hospital (Algeria) in 2014 . Tigecycline is one of the few effective therapeutic options for treating serious infections caused by MDR pathogens, such as K. pneumoniae . Resistance mechanisms of tigecycline have been comprehensively studied. Overexpression of multidrug efflux pumps such as AcrAB in E. coli , K. pneumoniae , and Enterobacter cloacae ; AdeABC in Acinetobacter baumanni , and MexXY in Pseudomonas aeruginosa  have been implicated to contribute to tigecycline resistance. For K. pneumoniae isolates with MICs no more than 8 mg/ml, AcrAB-TolC efflux pump played the most important role in the tigecycline resistant K. pneumoniae, while for strains with MICs≥16 mg/ml, both AcrAB-TolC and OqxAB efflux pumps are required . 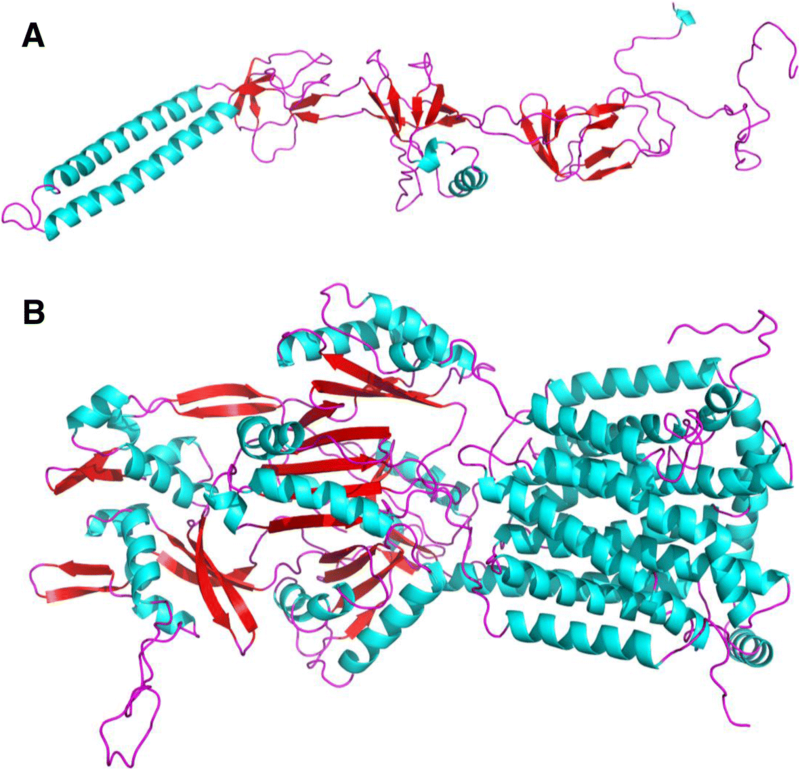 OqxAB efflux pump was also associated with the heteroresistance to tigecycline in Salmonella, which was attributed to the overexpression of AcrAB-TolC and OqxAB efflux pumps, since PAβb restored the susceptibility to tigecycline in heteroresistant isolates and accumulation of tigecycline in cell was also reduced . Veleba and Schneiders verified the important roles of ramA and rarA on the overexpression of efflux pump encoding genes acrAB and oqxAB, and its contribution to the tigecycline resistance in K. pneumoniae, Enterobacter cloacae and Enterobacter aerogenes [22, 80]. Higher transcription levels of rarA in conjunction with oqxB were also observed in tigecycline resistant K. pneumoniae isolates in comparison with a tigecycline-susceptible strain . By studying five isogenic paired clinical isolates of K. pneumoniae identified from same patient in a medical center in Taiwan, the researchers found that acquisition of tigecycline resistance in K. pneumoniae did not necessarily compromise their virulence and growth . They further reported that bacteremia, caused by infection with tigecycline-nonsusceptible K. pneumoniae was linked to high mortality, and previous medication of fluoroquinolones was the independent risk factor for the selection of tigecycline resistance in K. pneumoniae . Nitrofurantoin is a valuable antibiotic used to treat acute uncomplicated urinary tract infections . Resistance to nitrofurantoin in E. coli was primarily due to mutations in the nitroreductase genes (nfsA and nfsB), which participated in the converting of antibiotics into toxic intermediate compounds . Recently, plasmid-mediated oqxAB has been reported to be an important mechanism for nitrofurantoin (NIT) resistance . Ho et al. investigated the molecular epidemiology of oqxA and oqxB and its relationships with nitrofurantoin resistance in 341 strains of E. coli, which were recovered from patients suffered from UTI (n = 205; collected in 2004 to 2013) and animals (n = 136; collected in 2012 to 2013) . They found that the prevalence of oqxAB gene was significantly higher in the NIT-intermediate (11.5–45.5%) and NIT-resistant (39.2–65.5%) isolates than that in the NIT-susceptible strain (0–1.7%). In the 20 NIT-intermediate/resistant E. coli isolates, curing of the oqxAB-bearing plasmids could lead to the reduction of geometric mean MIC(NIT) from 168.9 g/ml to 34.3 g/ml. Acquisition of the plasmid-borne oqxAB could result in a 2 to 16 fold elevation of the MIC(NIT) and increase the mutation prevention concentration of NIT from 128 g/ml to 256 g/ml. The combination of oqxAB and nfsA (chromosomal nitroreductase gene) mutations was sufficient to confer clinically important high-level NIT resistance in E. coli . Since the discovery of oqxAB in 2003, the gene has been reported to locate on different plasmids with other antimicrobial resistance genes and virulence determinants in various bacteria, especially in E. coli, Salmonella and Enterobacter aerogenes. The plasmid-borne oqxAB was most likely to be originated from the chromosome of K. pneumoniae. The OqxAB efflux pump significantly contributed to reduced susceptibility to olaquindox, tigecycline, nitrofurantoin and chloramphenicol, and facilitated the development of high-level fluoroquinolone resistance. There is a great need to monitor the potential dissemination of the oqxAB gene among humans, animals and environment. Further investigation and understanding of the natural functions, determinants of mobilization, and the regulation of expression of the OqxAB efflux pump will aid in future strategies of antimicrobial usage optimization. We appreciate the kind assistance of Chunbei Liu and Anxiong Huang in the preparation of the manuscript. This review received supports from by National Key research and development program [2016YFD0501302/2017YFD0501406], National Natural Science Foundation of China , Fundamental Research Funds for the Central Universities [2662018JC001] and National Program for Risk Assessment of Quality and Safety of Livestock and Poultry Products [GJFP2019007]. However, the opinions expressed in this review are that of the authors. This narrative review was based on data extracted from published papers available in the public domain. JL, HHH and ZHY conceived the project, reviewed the articles and extracted the data. JL, HYZ, JNN, GYC and AS wrote the initial draft of the manuscript. All authors revised and approved the submission of the manuscript.